Meet Nadia Teixeira. For people who have not met Nadia and her infectious laugh and personality, she is the Manager of Westburne’s National Marketing programs and is located in Montreal. 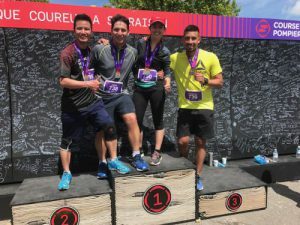 Recently, Nadia competed her very first half marathon, along with 600 runners, at the Firefighters Race of Laval. The event supports the Firefighters Foundation for Burn victims of Quebec. “It was one of the most exciting and satisfying things I have ever done! It gave me an amazing feeling of accomplishment. Running makes me happy! It gives me the sense of freedom and time for myself.” Said Nadia. Have you ever thought about competing in a race? Here are Nadia’s five tips to completing your first 5, 10 OR 21 kilometer race! Training works, so do it! Have fun – because that’s the whole point!